Our Perfect Fit Blinds are a simple yet effective solution for adding ventilation, shade, and colour to homes fitted with UPVC tilt n turn windows, french doors and conservatories. All standard designed window blinds require some fixing to surrounding window frames or walls. With UPVC window frames you are unable to drill or modify them as this would void your warranty. Perfect Fit Blinds appeal to homeowners because they’re seated within their frames so eliminating the need for drilling holes and damaging surrounding fixtures. The process for measuring these types of blinds is to measure the size of glass in the window and to compensate these measurements with the hardware such as handles that these blinds use. If lack of space is an issue, then our Perfect Fit Blinds could be your ideal solution. These blinds fit tightly and become an integral part of your window and so don’t clutter up your window sills. This also gives a clean and unobstructed look to your windows. Removing these blinds is a simple operation. Simply un-clip them and withdraw them from their frames. As these blinds fit snugly into their frames, this allows for a minimum gap between your window frame and the blinds, allowing less light and prying eyes to see into your rooms. 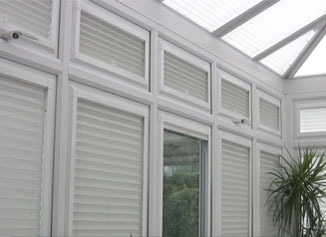 These blinds are also ideal for Velux skylight windows and conservatories where lots of natural light enters. 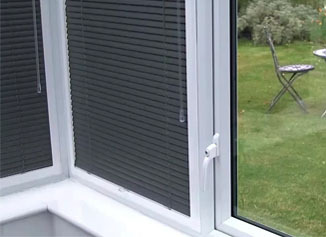 A discreet frame that clips between the beading and glazing of UPVC tilt n turn windows, french doors and conservatories. 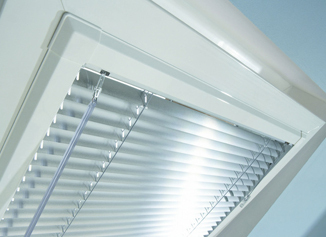 Works with Pleated,Venetian, wood Venetian and roller blinds. No drilling required, no free hanging cords. Blinds become an integral part of the window. Frames are avaliable all popular widow colours including white, brown,grey and brown. Tab operation inside a discreet frame.